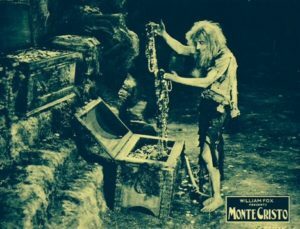 Another adaptation of Dumas’s The Count of Monte Cristo, a remake of the 1913 version, shot from the same basic script (to which Fox bought the rights), but greatly expanded for a film a half hour longer than its predecessor. Lead John Gilbert was a rising star at this point, though he hadn’t yet gained the popularity he would with The Big Parade (1925) and Flesh and the Devil (1926). Once again, Edmond Dantes succumbs to a conspiracy of envy and is imprisoned in the horrific Château d’If, only to escape and achieve his revenge, out-conspiring the conspirators as the chameleonic Count of Monte Cristo. The villains, each a different flavor of sleazy, are thoroughly despicable, and the innocent Mercedes, Dantes’s lost love, is wide-eyed and appealing. Gilbert looks and moves well in the rôle of Monte Cristo, and inhabits the count’s various guises convincingly. This version avoids the stage-play feel of its predecessor by employing frequent close-ups and switching camera distance and angle often. And it does a better job of explaining how Dantes comes by, not just his great wealth, but also the knowledge and culture that enable him to pass as the elegant and noble count. With its extra running time, there’s room to include more of the characters and twists of Dumas’s novel, adding robberies, lurid murders, duels, and impersonations. In fact, it’s somewhat over-ambitious, trying to jam in more of the novel than is comfortable in less than two hours. In the end it feels too contrived, and not even a final spate of swordplay and highway robbery can quite save it. It’s just too hokey.